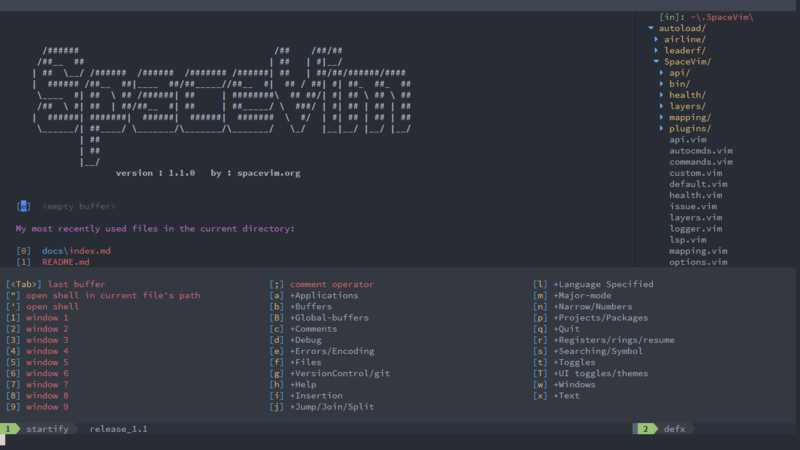 SpaceVim is a distribution of the Vim editor that’s inspired by spacemacs. It manages collections of plugins in layers, which help collecting related packages together to provide features. For example, the lang#python layer collects deoplete.nvim, neomake and jedi-vim together to provide autocompletion, syntax checking, and documentation lookup. This approach helps keeping configuration organized and reduces overhead for the user by keeping them from having to think about what packages to install. If you like SpaceVim, please feel free to star the project on github. It is a great way to show your appreciation while providing us motivation to continue working on this project. The current stable version is v1.1.0, See the milestones page for development progress and the roadmap for high-level plans. Is SpaceVim trying to turn Vim/Neovim into an IDE? With layers feature, this version of Vim distribution try to turn Vim/Neovim into an IDE for many languages. Which version of Vim/Neovim is needed? Vim 7.4/Neovim v0.1.7, and +lua or +python3 is needed. For more general questions, please read SpaceVim FAQ.